Here is a small piece of statistics from the ongoing Hero I-League 2016-17 which covers the amount of goals scored in every quarter of the clock. The below provided stats are valid only till Round 10 of Hero I-League 2016-17. 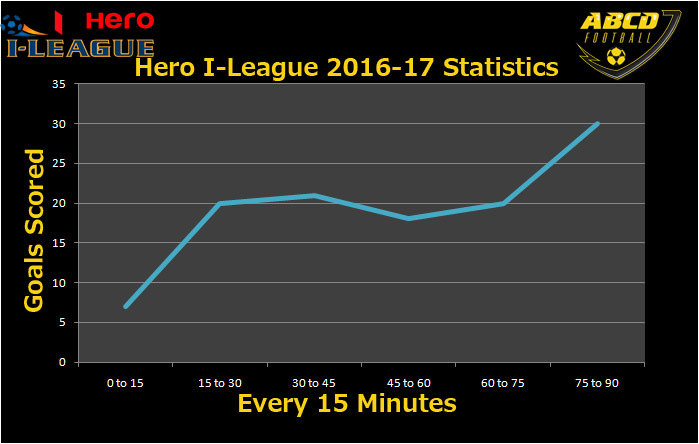 Hero I-League Statistics: Goals Scored every 15 minutes. The maximum number of goals(30 Goals) scored is in the final 15 minutes of the game. The minimum number of goal(7 Goals) scored is in the first 15 minutes of the game.